Share your computer's screen during your transmissions at Eventials. Eventials Broadcaster is an idealized application specially developed for the most talented speakers, who need to perform animated broadcasts, Power Point or Prezi presentations, Live Code and even play other videos. All this being accomplished by sharing the screen of your device. 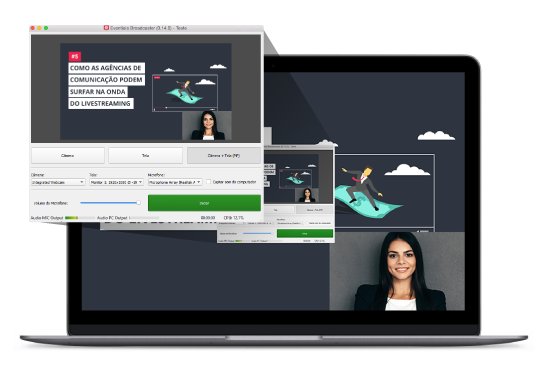 In addition, the Broadcaster also enables you to join camera capture, allowing you to set the size and position that is most convenient, making your webinar even more incredible. IMPORTANT: If you have registered with Eventials using social login from Facebook or Google, you will need to register a password at Eventials to use the Eventials Broadcaster. Click here to create a password. Broadcaster allows you to share simple presentations in pdf or more sophisticated with animations or videos. Put the camera so your audience can get to know you and make the presentation closer to the audience. Make your broadcasts more dynamic and make the presentation and video the size you think is most appropriate for your audience.